It was about lunchtime (1pm) in Herculaneum on the 24th August 79AD that Mount Vesuvius's 19 hours of eruptions started. Herculaneum, an ancient Roman town situated at the base of Mount Vesuvius near Naples (Italy), was completed buried (and preserved) by pyroclastic mud flows. 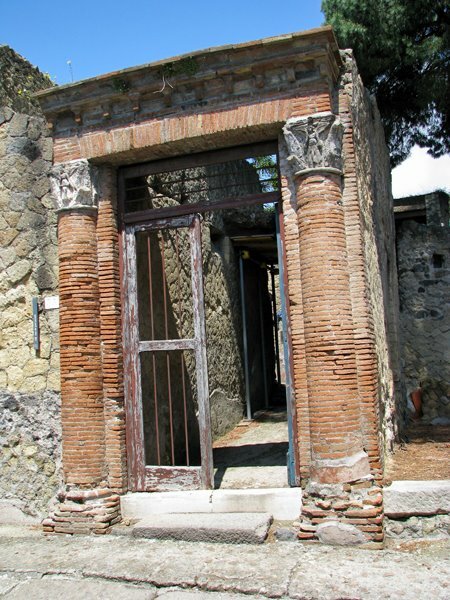 In its time a resort town for the upper class, Herculaneum was rediscovered in 1709 when a peasant was digging a well. Herculaneum is generally better preserved than the more famous and much better documented Pompeii, and its preservations offers probably the best opportunity of getting a feel for how an ancient society would have operated. Marco Nonio Balbo was a patron of Herculaneum and a senator of Cyrene and Crete, who was cremated and had his ashes stored in a clay container in the marble facade beneath his statue (hence the name, Terrace of Marco Nonio Balbo). To the right of the terrace are the bath houses. Herculaneum is just as fascinating from above as from below. One of its charms is the continuity of the city, with new houses being built next to (and above) the ancient ruins. "Herculaneum" translates to "Ercolano" in Italian. Within the town of Herculaneum you'll want to find the excavation site of the ancient town - this is signposted as "scavi". Catch the Circumvesuviana train from Naples (central train station in Piazza Garibaldi) to the Ercolano Scavi train station, and walk down Via Vittorio Veneto in a south-westerly direction. As you pass the fountain commemorating the victims of the 79AD eruption, you continue walk ing down Via 4 Novembre. Pass the Hotel Ristorante Ercolano. Once you've paid for your tickets, walk through the turnstiles and enjoy! Cross the bridge over a swampy river, and you're in the ancient Roman town of Herculaneum. Why settle next to a Volcano? Herculaneum is smaller than Pompeii - it had about 4000 inhabitants. In Roman times people weren't aware of the danger and didn't even know the mountain was a Volcano - they liked settling near the volcano as the soil produced is rich in nutrients, minerals and retains water like a sponge; and this translates into fantastic crops. These days people settle there willing to take on the risk, hoping that the eruption wont take place during their lifetimes. As Vesuvius erupted it threw a column of gas and ash high into the sky (10 miles high within minutes), which would have looked gigantic from one's perspective in Herculaneum or Pompeii. The wind carried the cloud of ash east towards Pompeii, so that those in Herculaneum could see the cloud but it didn't go dark there (like in Pompeii). Hurling ash on Pompeii for 12 hours, the eruption had the destructive force of hundreds of Hiroshima bombs. In the evening at around midnight the volcano's eruption column collapsed, and at the speed of a hurricane; molten rock, mud, ash and superheated gas hurtled towards Hurculaneum (called a hyperheated pyroclastic flow). In some places the successive pyroclastic flows ultimately (after 12 to 24 hours) covered Herculaneum as deep as a 4 storey building. In 79AD Herculaneum part of a Roman Empire stretching from Jerusalem to Britain. For a long time it had been believed that everybody in Herculaneum had escaped the eruption, as only a few dozen skeletons were found. It wasn't until they went right down to the level of the ancient see that some 200 skeletons were discovered (the shoreline changed as a result of the debris from the eruption), and it has been discovered that the end was even more horric than in Pompeii. The baths are probably the most beautiful surviving baths from the Roman world - not as big as the baths in Rome, but much better preserved. Herculaneum is better preserved with upper storeys and organic material (wood, cloth, bread, wicker baskets) surviving. The wood could survive as the hyperheated pyroclastic flow first carbonated and drove moisture out before covering it. Empty spaces in the ashes at Pompeii, were filled with plaster of paris, which when dug out formed the shape of humans. Not all of the ancient city of Herculaneum has been excavated, as above it lies modern Herculaneum (making it very dangerous to excavate). The excavations are closed on the 1st May, Christmas day and New Year's day. J visits The "House of the Grand Portal" in Herculaneum. This is also known as "Casa del Gran Portale" in Italian or "House of the Great Portal". The house gets its name from the brick columns topped with Corinthian columns depicting winged Victories. Starring Liev Schreiber and Joann Fletcher, Secrets of the Dead sets out what life was like in Herculaneum before the 79AD eruption, and tells the story of the pyroclastic flows which caused horrific damage to those it encountered in Herculaneum. A University of Texas Classic Professor and her student are drawn to Herculaneum by the story of a slave girl, Iusta, told on 18 wax tablets found in a Villa in Herculaneum. Castel dell Ovo just outside Naples.